The problem with simply following character archetypes, however, is that many characters do not, by necessity, fall into a set ‘type.’ For example, consider the idea of the Hero archetype. A Hero may also be a Caregiver, Magician, Creator, Explorer, Outlaw, Jester or any other type that an author can imagine. A Villain may also be those character ‘types.’ And so there are more ideas in character development than simply looking at archetypes. One of these other ideas is Character Alignment. The following chart lays out the outline of the concept of the categories in which characters can fall into an alignment with. This is a concept created from the classic Dungeon and Dragons concept, but which has great applications to general story creators as well. Essentially, the Character Alignment breaks up character types into nine possibilities for how they fall between good and evil, law and chaos. Good has to do with the concept of valuing and desiring to preserve life, while evil has to do with a desire to destroy and oppress life. Law has to do with the concept of holding to traditions and laws, keeping to the rules. Chaos therefore has to do with following one’s own desires and emotions, and acting in a spurious fashion. Lawful Good characters act according to the highest of noble and just virtues. They are the epitome of goodness according to the outward views of a society. Characters following this alignment have a tendency towards following the orders of a ‘good’ government in the quest for peace. They are zealots, who see the government or established order as the source of moral purity and seek to work to provide ‘ordered goodness’. Neutral Good characters try to act according to a set of noble desires and do their best to follow these rules. They work with established order, but are not obliged to follow the biases of these organisations. A character following the neutral good alignment follows goodness according to their own inward sense of morality, similar to a chaotic good character. However, unlike Chaotic Good characters, Neutral Good characters will work with governments if they see governments as a source of good. Lawful Neutral characters, are characters who act to bring order according to their own, or a government’s moral code, regardless of good or evil. They do not pursue the same actions as zealots, but they tend towards pressing judgment upon others regardless of whether this is just and true, so long as the final verdict promotes law and order. 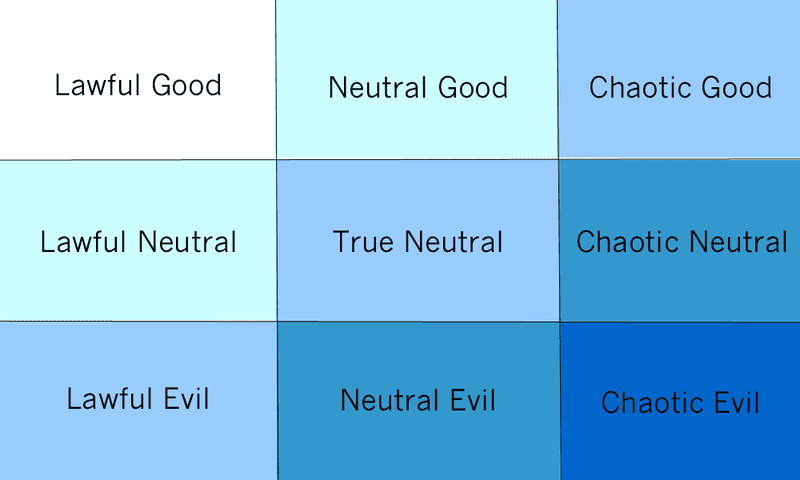 True Neutral characters do not act in any particular way with regards to good or evil. True Neutrals would prefer to be surrounded by characters affiliated with good. Yet they will not step out of their comfort-zone to uphold good in any particular way. Nor are they driven to uphold a balance, or conquest of good over evil (or vice-versa). Such characters are often the rulers of pacifistic countries within narratives. Chaotic Neutral characters follow their own whims and desires. They are the Tom Bombadil characters in narratives. The free-spirited godlings and fairies of fantasy literature. They are neither associated with good, nor evil, they merely act according to what they see as best for themselves. These characters are, however, not entirely random. They are simply driven to look after themselves first and not take sides in any particular conflict. Lawful Evil if Lawful Good characters are angelic warriors, then Lawful Evil characters are their opposites: devils bound by a set of honorable rules that profit themselves. They are the tyrants who rule with an iron fist. Using order and the rules of their governance to crush and destroy those who would stand against them. Neutral Evil characters are the individualists who do not care who they have to kill, steal or destroy to achieve their own desires. They are the wicked pirates without a cause or sense of honour. They seek to further their own wicked schemes. Unlike Chaotic Evil, Neutral Evil characters will not kill or destroy for the pure lust of doing so. They only kill to further their own neutral aims. Chaotic Evil characters are demonic and hateful, full of unpredictability. They are the Joker. They are insane, free spirited and likely to kill for the pure enjoyment of doing so. Chaotic Evil characters are not random in their actions. But they are unpredictable because their alignment leads them do whatever is pleasurable and self-centred around them. These alignments are again, useful tools for helping writers to construct and develop their characters. However, part of developing a character is the hero’s journey. The concept of evolving a character. Characters do not start as heroes in their fullest sense. Nor do they start as villains. Narratives, and stories, that you write may begin with the characters at their most heroic. However this means your narrative has skipped an entire backstory that has lead to the hero existing at their peak. And the same continues for a villain. It becomes the duty of the author to explore the backstory of their characters as they write. To explore what developed the character into their particular alignment. Characters may exist as Lawfully Good at the beginning of the novel. Yet the real skill of the author exists in how you explore their true development: do they become Lawfully Neutral? Do they become Chaotically Good? Do they stay the same because of their stubborn personality? A skilled author understands the nature of their characters. They understand their motives, alignments and archetype – and is constantly writing with these aspects in mind.